268 pages | 4 B/W Illus. 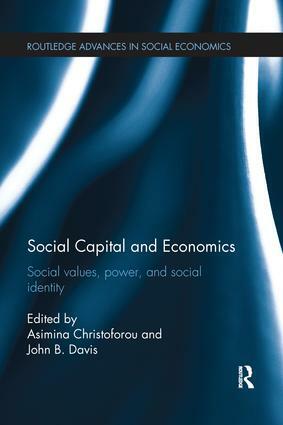 This volume provides a collection of critical new perspectives on social capital theory by examining how social values, power relationships, and social identity interact with social capital. This book seeks to extend this theory into what have been largely under-investigated domains, and, at the same time, address long-standing, classic questions in the literature concerning the forms, determinants, and consequences of social capital. Social capital can be understood in terms of social norms and networks. It manifests itself in patterns of trust, reciprocity, and cooperation. The authors argue that the degree to which and the different ways in which people exhibit these distinctively social behaviours depend on how norms and networks elicit their values, reflect power relationships, and draw on their social identities. This volume accordingly adopts a variety of different concepts and measures that incorporate the variety of contextually-specific factors that operate on social capital formation. In addition, it adopts an interdisciplinary outlook that combines a wide range of social science disciplines and methods of social research. Our objective is to challenge standard rationality theory explanations of norms and networks which overlook the role of values, power, and identity. This volume appeals to researchers and students in multiple social sciences, including economics, sociology, political science, social psychology, history, public policy, and international relations, that employ social capital concepts and methods in their research. It can be seen as a set of new extensions of social capital theory in connection with its themes of social values, power, and identity that would advance the scholarly literature on social norms and networks and their impact on social change and public welfare. Asimina Christoforou is Adjunct Professor, at the Athens University of Economics and Business, Greece. John B. Davis is Professor of Economics, Marquette University, Milwaukee, Wisconsin, USA and Professor of Economics, University of Amsterdam, the Netherlands. This series presents new advances and developments in social economics thinking on a variety of subjects that concern the link between social values and economics. Need, justice and equity, gender, cooperation, work, poverty, the environment, class, institutions, public policy, and methodology are some of the most important themes. Among the orientations of the authors are social economist, institutionalist, humanist, solidarist, cooperativist, radical and Marxist, feminist, post-Keynesian, behaviorist, and environmentalist. The series offers new contributions from today’s most foremost thinkers on the social character of the economy. Publishes in conjunction with the Association of Social Economics.